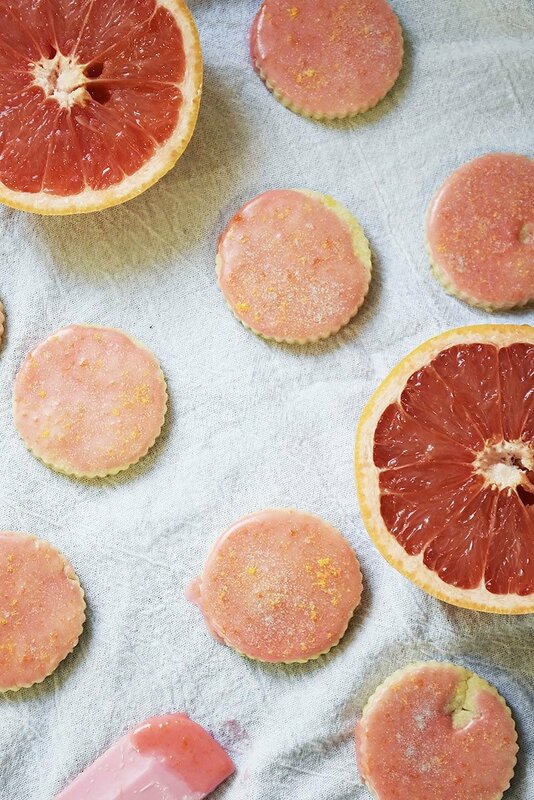 These little citrus beauties are full of bright citrus and buttery goodness! Melt-in-your mouth treats that are crazy easy! These shortbread cookies couldn’t be any easier! 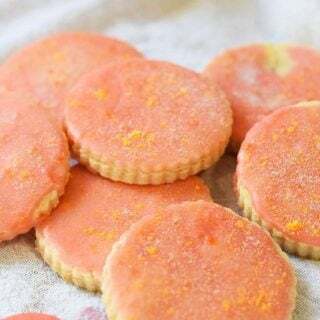 I use my favorite 3 ingredient shortbread cookie recipe and pump it up a bit with a bit of grapefruit zest and vanilla. The grapefruit icing is simple to make and only requires a bit of a dip and dry for that pretty look. 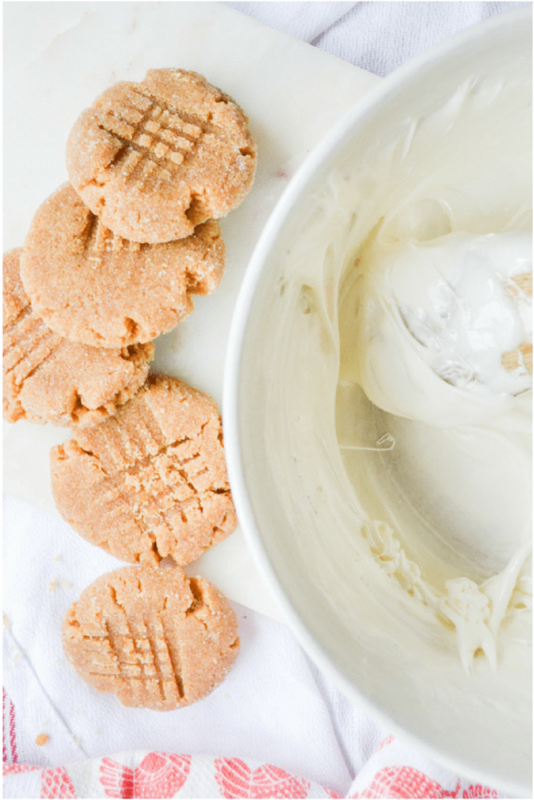 An elegant, pretty, and utterly delicious cookie recipe! I learned how to make shortbread cookies when I was very young. In fact, I have memories of one of my sisters making them at a very young age, as well. Because they are such simple, every day ingredients…my mom would allow us to make them quite often. When you have 10 kids, a little butter, flour, and sugar is an easy price to pay for a few moments of quiet. Now I completely understand why we always got a yes when we asked to make these little treats. 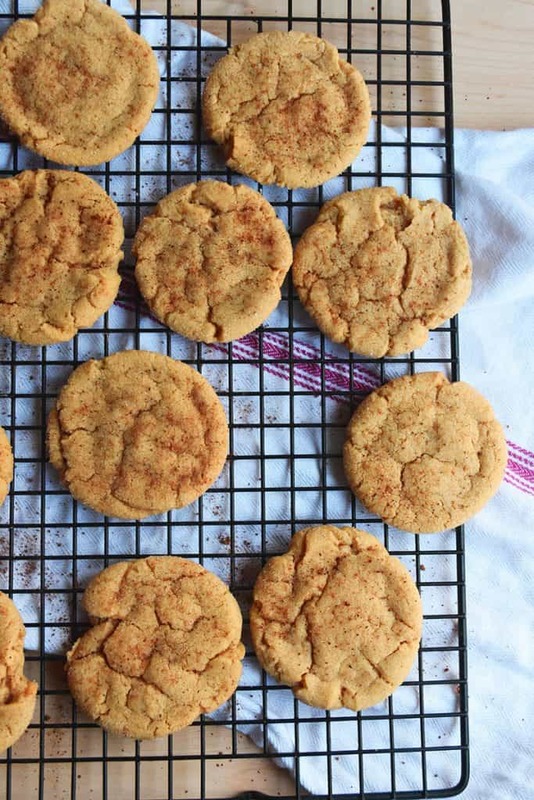 The 3-ingredient shortbread cookie recipe is the one I’ve been making since I was a child. Classic, simple, and always turns out fantastic. The recipe is also a wonderful recipe to adapt and change. dip half of the cookies in melted chocolate and nuts. mix in a bit of fresh herbs. Thyme and Rosemary are my favorites. use a bit of lavender or rose oil. <—this is simply gorgeous to smell! give the cookie a thumbpress before baking and fill with a wee bit of jam. mix in chopped walnuts and roll in powdered sugar when baked. 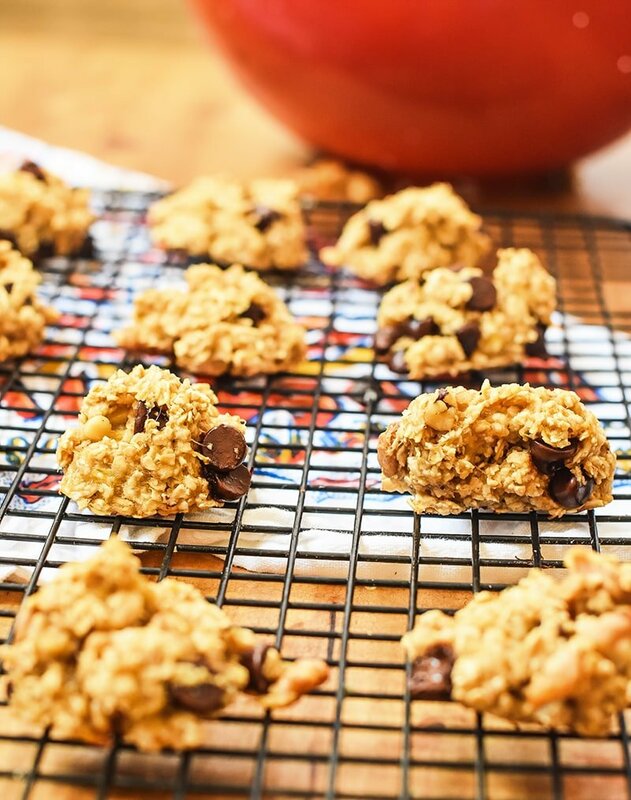 Truly, these are my favorite cookies because of how delicious they are AND versatile. Every Christmas, this is the recipe that will be used again and again. In fact, I bet that most of my family and friends don’t even realize that multiple of the cookies I make are from the same dough. I just separate it out and add mix-ins, extracts, and shape them differently. Peppermint candy canes are red food coloring and a bit of peppermint extract in half of the dough, rolled into logs, and twisted to shape. Swirls are espresso and cocoa in half of the dough, stacked on top of each other, rolled up, and sliced. Pecan sandies dough is filled with chopped pecans, a bit of vanilla extract, and shaped like a ball. After they are baked I give them a good dusting of powdered sugar. I KNOW…so efficient. These cookies truly are magic. Are sugar cookies and shortbread cookies the same? Nope. And one of the main reasons is that sugar cookies have many ingredients. Shortbread cookies have very few. Also, sugar cookies tend to be a bit crisp and light, shortbread cookies are buttery, heavy, and softer. Honestly, shortbread cookies are sooooo easy. I rarely make a sugar cookie when a shortbread cookie is an option. In fact, as of right now, I don’t think we even have a sugar cookie recipe on NellieBellie. Gosh, I just realized that! 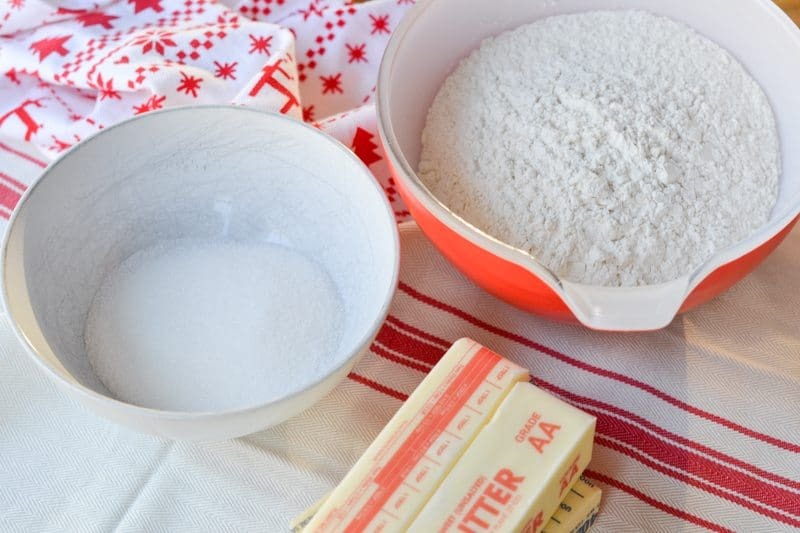 Gather your 3 super simple ingredients: flour, sugar, and butter. Note: The butter should be room temperature. Whip your butter and sugar together for a very long time (about 6 minutes). <—this is the part that people often shortcut. Don’t! And why would you, it’s not like this cookie has a ton of steps? You can take your time on this. Why do you need to chill shortbread dough? The short answer: so they hold their shape and don’t spread. The long answer: the fat (butter) that we put into the dough gives it that silky melt-on-your-mouth texture BUT if that fat is too warm when it hits the oven it will melt and spread out our dough. Chilling the dough solidifies the fat and the short cooking time for these cookies isn’t enough to warm that fat up and spread our dough. Our cookies keep their shape and melt-in-the-mouth. I utilize a smaller biscuit cutter to get those charming scalloped shapes. You know, the kind used for buttermilk biscuits (I have a set with multiple sizes). Those biscuit cutters have proven to be quite handy! The thinner you roll out your shortbread cookie dough, the better. Mostly. But, I don’t want you to get so thin that they burn too quickly. So, let’s say under 1/4 of an inch is too thin. But gosh, if you have the patience to get them under 1/2 inch you will be super pleased with how they melt in your mouth! Honestly, I rarely have the patience to roll them out that thin. 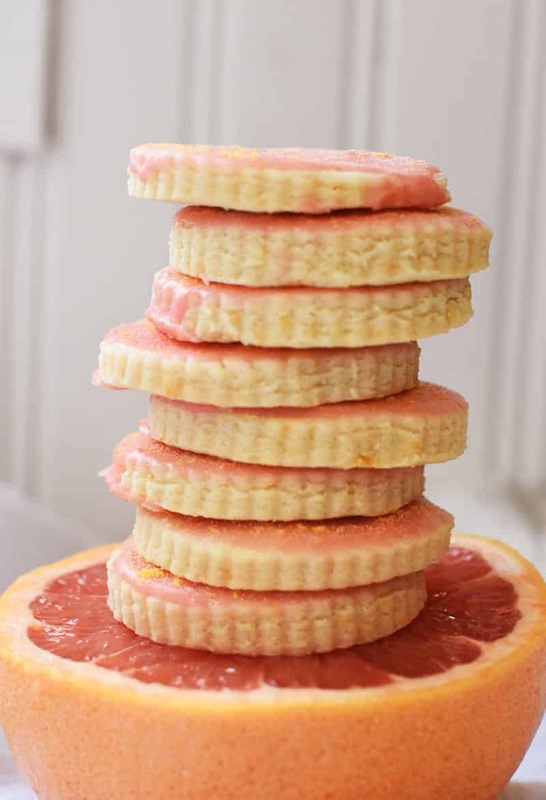 These grapefruit shortbread cookies are a great example of how you can utilize a simple shortbread cookie base and, with a few very simple additions, turn it into a superstar show-stopper! 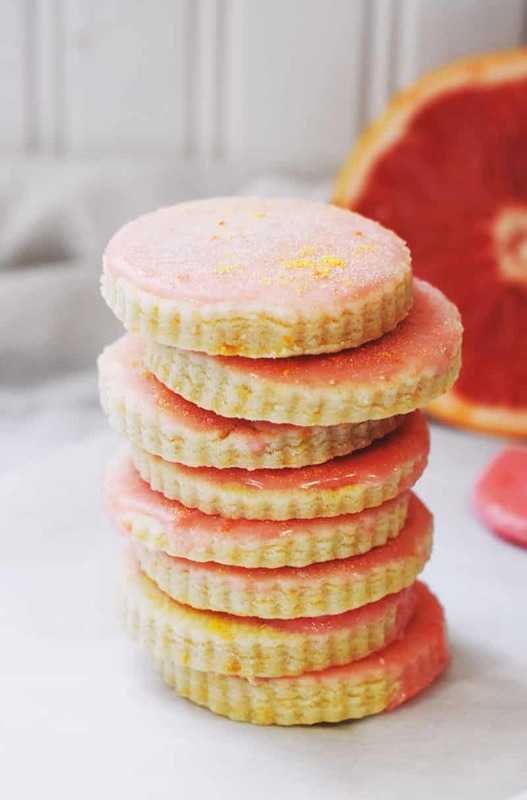 Adding grapefruit zest and vanilla to the cookie dough and dipping the cookie in a bit of grapefruit icing is all it took for these gorgeous little treats. Honestly, these are my current favorite. Light, citrus-y, butter, melt-in-your-mouth, GORGEOUS, little cookies that make the house smell Ah-Maz-Ing when you bake them. In the winter, I throw a bit of thyme into the dough and icing to warm them up a bit. But in the summer? Oh man..ALL the zest and juice and brightness! 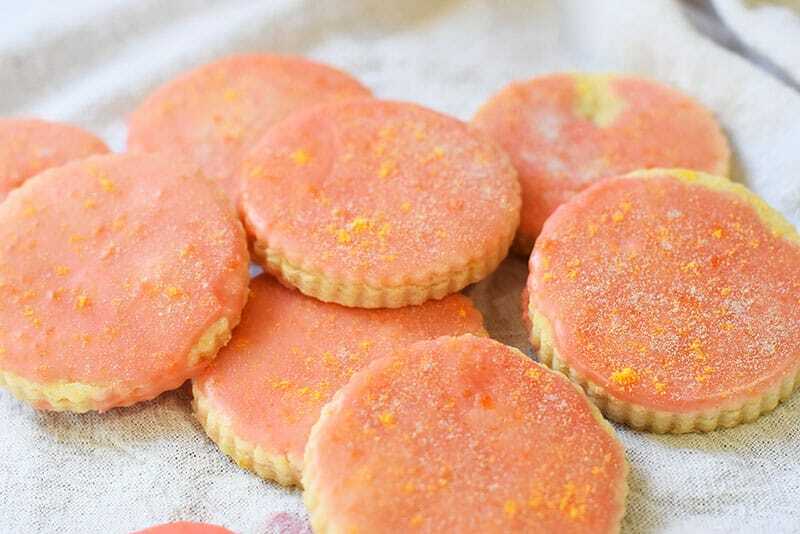 If making the grapefruit cookies, add the zest to the butter and sugar before beating. Beat the butter and sugar together until white in color...about 6 minutes. Beat in the vanilla, if using. Beat in the flour just until combined. Press the dough into a ball. If the dough is too dry and not coming together, add a tablespoon of milk or water (repeating as necessary) until you can shape it into a ball. Put the dough into the fridge to chill for about 1 hour. On lightly floured surface, roll the dough out to 1/2 inch thickness. Use a cutter to cut 2 inch diameter circles. OR, roll the dough into a log about 2 inches in diameter. Slice 1/2 inch thick slices. At 350 degrees, on an ungreased cookie sheet, bake the cookies for about 8-10 minutes. --do NOT overbake. Do not let these cookies get golden brown. Put the juice into the mixing bowl and add about 1 cup of powdered sugar, beat well. Add the zest. And then slowly add in the additional powdered sugar. Continue beating until well combined. If needed, add powdered sugar or juice. Dip the tops of the cooled cookies into the icing and set parchment paper or rack. Let the icing dry and harden for about 15 minutes. Wait a couple of hours before stacking them. When you start rolling and cutting your dough, work fairly quickly so the dough doesn't have a chance to warm up again. If needed, keep part of the dough in the fridge until you are ready. I can’t find the printable recipe or even just the recipe for these cookies. The link looks broken? Oh no!! It looks like something went wonky. Thanks for letting us know. (makes me nervous that I don’t know how long it has been like that). I’ll get that fixed asap.